…to take care of the little things that can make a big difference for your lawn and garden. Whether you choose to DIY or have a professional, like Emerald Lawns, handle them, it’s worth the expense. It’s best to start your work about six weeks before the first hard freeze. Topdressing is organic matter spread over the top of the soil. You are basically “dressing” your lawn for the cooler weather to come. To top dress soil for a lawn, use organic matter including manure. These are available at most gardening centers. Avoid wood chips, straw, and other materials that rob the soil of nitrogen. After removing all debris and tilling the soil, spread the organic matter on top and use a rake to mix it into a depth of about 2 inches. The higher the percentage of organic matter, the looser the soil will be, allowing roots to grow easily. For most lawns, a good goal is to produce soil for the top 2 inches that is 15 to 25 percent organic matter. Here’s the quality composition we use. Timing is crucial when it comes to aerating lawns. And the most important factor in determining the appropriate timing for lawn aeration is your lawn’s climate and geographic area. It is advised not to perform lawn aeration during the heat of summer or during winter dormancy. The part of the aerator that does all the work is the “tine”. This part of the aerator creates the holes in the ground. Tines can be hollow or solid. Hollow tines are the most common and preferred because they pull a “plug” from the ground and deposit it on the surface encouraging thatch break down and relieving soil compaction. Solid tines penetrate the soil and make holes but do not pull cores. Consider having a trained lawn care specialist give your lawn a ‘care evaluation’. Only the professionals can determine the appropriate core lawn aeration techniques and specifications that are right for your lawn. As a homeowner, you have two types of mulch to choose from – organic and inorganic. Organic Mulches are derived from decomposed plant materials to enrich and improve the soil. Manure, sphagnum peat moss and pine needles are all examples of organic mulch. Inorganic or fabricated mulches are utilized mainly for color and texture changes. Pebbles, stones, and plastics are examples of inorganic mulches. A new inorganic product is geotextiles or landscape fabric, which can be used as effective weed barriers. Use them for more decorative products such as stones or bark. Mulching is often needed in the fall. For established plants, the timing of the mulch application may not be as important as it is on new plantings, especially shallow-rooted shrubs and evergreens, herbaceous perennials, or strawberries. Heaving of small plants, especially those newly planted, occurs following alternate freezing and thawing of the soil. To reduce heaving, which breaks roots and leads to winter injury, apply mulch following the first indication of frost on the ground. Mulching slows the thawing cycle and thus heaving. For established plants, water thoroughly in late autumn if the soil is not already moist, then mulch. Reduce heaving (plant roots forced upward out of the soil) of small plants as a result of alternate freezing and thawing of the soil in autumn, winter, and spring. Add organic matter to the soil, if mulch materials are organic in nature. Keep fruits, vegetables and flowers cleaner. Improve the aesthetics of a landscape and add to property values. Let us know if Emerald Lawns can help with your lawn care needs. 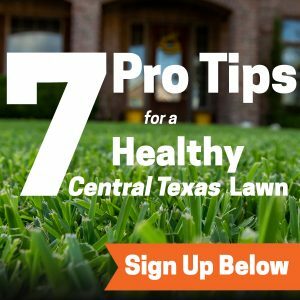 Give us a call today at 512-990-2199 for a free, no-obligation lawn evaluation.